Remember Rylo from this time last year, when the imaging startup launched a creative take on the 360 camera. The company’s been fairly quiet in the six months since it launched some new software tricks, but a new round of funding should help the company take some key steps toward spreading the gospel. This week, Rylo announced that it has secured a $20 million Series B, led by Icon Ventures. That brings its total up to $35 million, with help from Accel Partners and Sequoia Capital. Plans for the funding are pretty much what you’d expect. Rylo’s camera represents an interesting piece of tech that utilizes 360 videos to create some unorthodox camera tricks, like stabilizing images, following subjects and creating a number of interesting effects. The product also has solid distribution with more than 500 retail locations in the U.S., including Best Buy. 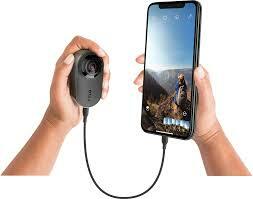 Marketing, however, is going to be key for the success of the $499 camera, whose initial appeal is not as immediately apparent as the likes of GoPro.